A Sandwich Lovers Delight at Wright's Gourmet Deli!!! A Sandwich Lovers Delight at Wright&apos;s Gourmet Deli!!! Hey there Tampa Bay foodies! 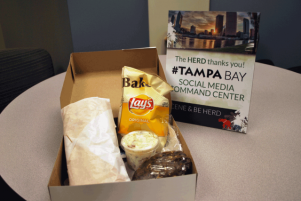 Still working hard here at the Social Media Command Center and wanted to share with you about one of my favorite restaurants here in the Tampa Bay area! If you haven&apos;t had a chance to stop by Wright&apos;s Gourmet Deli and sample the food, then you definitely need to put it on your list of things to do! The sandwiches here are a beast, and we were fortunate enough to today to have our lunch catered by the fine folks over there! The gang from Wright&apos;s brought us over some of the best boxed lunches you will ever have in your life, full of Cuban Sandwiches, Cookies, Chips, Turkey Sandwiches and some of their amazing potato salad! Once again, afterwards I was too full to even continue tweeting and telling all of our RNC visitors. Just joking, as I can never be too stuffed to tell everyone how much we love Tampa! Wright&apos;s Gourmet Deli is located just off of N. Dale Mabry, in Tampa, so be sure you make it over there and check out some of the awesome menu items! For more information on Tampa Bay dining and great gourmet deli&apos;s be sure to check out our website at http://www.visittampabay.com/visitors/restaurants/!